Tummy-toning gel with 6 active ingredients and an ab-activating applicator. To sculpt a six-pack, you need to exercise and eat healthy - but to help you in your quest for a covetable core, Bliss developed this tummy-toning gel. The targeted treatment contains a powerful blend of six actives to assist in toning and firming: caffeine plus amino acids, creatine, oat kernel extract, latex-rich manilkara tree extract, menthol and a special botanical extract. They're all delivered with a built-in nubbed applicator, designed to strategically massage the formula into your skin. 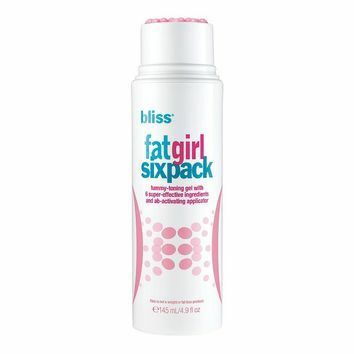 Add Fat girl six pack to your bod-bettering regimen to get one step closer to 'ab'-solutely amazing results! Massage into midsection in a circular motion twice a day for 20-30 seconds.